I was rec ently reminded that publicity is perhaps one of the most important tools for a non-profit organization. Athletes C.A.R.E., a student athlete organization focused on ending homelessness and hunger, received an unexpected shout out from Nick Young of the L.A. Lakers on a recent episode of Cupcake Wars: Celebrities. This was an unplanned windfall for Athletes C.A.R.E., but absent a plan to respond and capitalize on the event, it would have ended as a one-time happening missed by many. Fortunately, Athletes C.A.R.E. took advantage of its active social media presence. For non-profits, leveraging social media can mean a huge boost in messaging attention, and even fundraising. The first step is to post about the event. Take to every platform where you have an active presence and let followers know your organization has been publicly recognized. In those posts, be sure to tag the relevant names and organizations. For Athletes C.A.R.E., this meant tagging Nick Young, the L.A Lakers, The Food Network and Cupcake Wars. By tagging the appropriate parties (and their social media accounts) you widen the reach of your post and expose your organization to broader audiences. Now not only will your followers see the post, but the followers of anyone you tag will see the post as well. Additionally, you can reach out to your local newspaper and other local media outlets to alert them of events such as having Nick Young reference your non-profit on national television. Something at that level might warrant a local news story. Finally, you can follow-up two or three more times via social media over the course of the following week, pointing out different aspects of the initial event to extend the message and the reach. However posting more than that will likely be unwelcome. And any additional social posts about the event should be broken up by other content on social media. With limited budgets and personnel, publicity and social media are two of the strongest tools in a non-profit’s arsenal. The ability to capitalize on and expand your organization through opportunities such as the situation with Athletes C.A.R.E. will strengthen your organization and help spread your message. This post is courtesy of Cassidy Taylor, Lafayette College class of 2017, Kimball’s summer 2016 intern. Some small business owners don’t believe in using experts for social media engagement and content development. They see the practice as novel and unproven – until it isn’t. Such is the case of The Union Street Guest House in Hudson, N.Y. This picturesque small town inn quickly discovered the demonstrative impact of social media when comments about a fines-for-reviews policy hit the inn’s Facebook page and Yelp, the popular online review site. 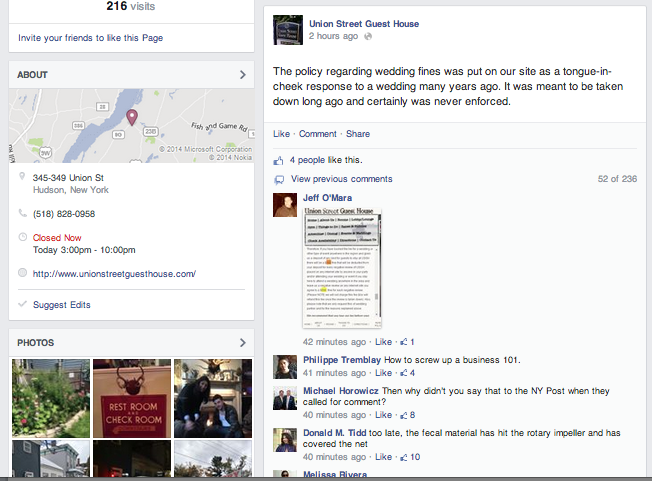 According to an ABC News story resulting from the social media dust-up, the inn claims its “policy” was posted to its website as a tongue-in-cheek response to a wedding from years ago and should have been taken down. The policy in essence stated bridal parties would be fined $500, taken from deposit monies, for each negative review the inn might receive connected to a particular wedding or event. 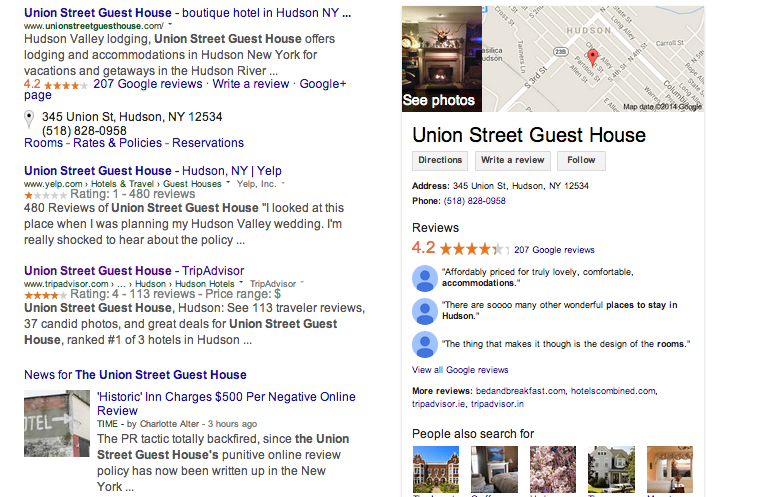 A Google search for the inn’s name brings with it a wealth of negative online content that will impact the business’ bottom line. Unfortunately, a simple Google search of the inn’s name now produces both a link to the inn’s website, as well as countless social media and news articles referencing this not-so-amusing policy. The result is a Search Engine Optimization nightmare for the inn coupled with a runaway train of negative comments on its Facebook page (more than 200 at this writing; although it appears the inn may now be deleting posts from its Facebook page). Since this firestorm hit mainstream media, the inn’s Facebook page has been inundated with negative posts. The news coverage and social media firestorm – with only a half-hearted response from management that appears to have since been deleted – have created a massive public relations problem to overcome. This isn’t the type of crisis you wait out. And without a strategy for responding to and recovering from this communications nightmare, The Union Street Guest House is likely to see a steep decline in business, assuming it has the wherewithal to survive at all. Small businesses are successful because they do what they do well. Where they often fail is when they try to do something outside of their expertise. By consulting with a social media professional or brand content specialist, small businesses can avoid errors – even tongue-in-cheek responses – that might not seem substantial at the time, but with an extra set of trained eyes, can be seen for the potential disasters they are and thus avoided. Alternatively, bringing in the professionals after a crisis has erupted is not optimal, but it can mean the difference between staying in business or going under. Most freelancers or public relations agencies can find equitable arrangements with small businesses that won’t break the bank, and can avoid or attempt to correct business-ending mistakes. For a free consultation on how working with a public relations agency can help protect and promote your business, please contact me at rhughes@kimballpr.com. 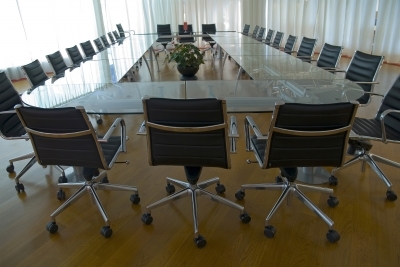 At big agencies, you’re paying for the overhead … and all those chairs. However sometimes the safe bet with PR agencies isn’t always the best bet and the little guy is overlooked to the detriment of the company conducting the search. To those companies, I offer six reasons they would do well to consider small agencies like mine. It’s Personal, Not Just Business. Working with a smaller agency, clients typically have direct access to the agency president and senior staff. So do the agency’s employees. This means ideas aren’t just top-down, and everyone has a stake in the success of the account. What You See Is What You Get. The better-run small agencies have less staff turnover, especially at the senior level. So the folks you meet at the new business pitch meeting are the folks actually doing the work for your company. That almost never happens at big agencies. Small Agencies Are Built By Big People. Small PR agencies are populated with PR pros who left big agencies to focus on good work instead of billable hours, or by established journalists who bring a well-honed reporter’s eye to the story-craft of public relations. Big agencies are not the only bastions of talent. Budgets Don’t Drive Success. Small agencies have less overhead then larger competitors. This means smaller agencies work toward success, not billable hours. At larger agencies, clients with small budgets are often relegated to a few hours of work per month, led by the most junior, least experienced staff members. Flexibility and Responsiveness Are Watchwords. Small agencies usually don’t have “big” accounts to fall back on, so ensuring every client feels like the only client is the hallmark of a well-run small agency. This means responding promptly to clients, and being able to adapt well to changing priorities. It’s a Business of Personality and Ideas. Success – with big or small agencies – is predicated on the people on the account and the ideas they generate. In this area, size is not a factor. One smart, industrious solo PR pro with good ideas and a little elbow grease can be as valuable to a client as an army of well-polished and mildly talented PR practitioners. As Twain said, it’s about the fight in the dog. I’ve heard too many stories from clients and co-workers alike about companies that chose big PR agencies based purely on the idea they were a perceived safe bet. (As the saying goes, “Nobody ever got fired for hiring IBM.”) These same folks, after prolonged discovery periods and big “start up” fees, came to find bigger isn’t always better. Sometimes bigger is just bigger. In my internal life as a secret pundit, I hold strong, unpopular opinions on a wide range of topics. I’ll spare you my monologue on the proper storage of tomatoes, but let’s discuss my wildly unfashionable opinions on Facebook, which are probably more relevant to your interests. Here’s a radical thought: Facebook doesn’t work that well for some brands, particularly small B2B service providers. Yes, that Facebook—the stuff of marketing mavens’ dreams. For many, it turns into a marketing nightmare; after devoting time and energy to creating and curating a brand page, a chorus of crickets greets you instead of legions of grateful fans. Many self-proclaimed social media experts will suggest that you are doing it wrong. That is true in some cases, but not all. If Facebook isn’t working for you, I think there are a few reasons it is more than okay to stop using your brand page. 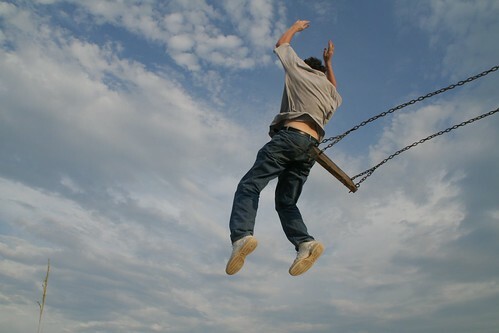 Contrary to popular belief, using Facebook as a PR and marketing tool is far from free. It is time-intensive, no matter what strategies and tools you use. It’s cliche but true: at work, time is money. To get the most out of a Facebook brand page, you should spend time and money not only perusing and posting, but also creating videos and custom visual content like infographics, memes and quality photos. Last time I checked, graphic designers don’t work for free. Plus, paid ads, contests and promoted posts are often the only way to get any semblance of a noticeable boost in fans and engagement. This could be time and money well-spent, but not if you don’t see results. When I say engagement, I’m not speaking in abstract jargon. What I mean is people seeing, liking, commenting beneath and clicking thru to your content. On Twitter, engagement defined this way is possible any time someone logs on and scrolls through their feed. On Facebook, what someone sees on their News Feed depends on a number of factors analyzed by the company’s EdgeRank algorithm, which you can read more about here. From a personal user’s perspective, there are advantages to EdgeRank and otherwise being in control of your News Feed. For example, with a few clicks, you can hide future posts from your Facebook-addicted auntie and never again be subjected to her semi-literate rants on the tyranny of everyday objects. However, the same tool may prevent a user from being exposed to your brand’s content, even if s/he would like to see it—which s/he presumably does, since s/he “likes” you. Users rarely return to a brand’s Facebook page after they have liked it, so they won’t see your pithy posts there. And if you don’t share a photo, it is unlikely that they will see a post in their News Feed. As many have lamented, EdgeRank prefers gimics over content that is relevant to your audience. If you provide B2B services, or something that is equally ill-matched to meme-ing or Harlem Shaking, you just may never stand out. Should you want to stand out on Facebook? This question nags me. For companies that provide consumer products or entertainment, the Facebook News Feed is a natural fit. You want to be (and often are) an integral part of your customers’ personal lives, so you fit in snugly between a cousin’s baby pictures and political rants from college friends. For most other kind of brand, the Facebook News Feed is an awkward fit, like trying to wear the clothes you thought were cool at age 15. No one thinks you look cool in those JNCOs, and no one wants to hear about some esoteric corporate service while they are perusing their iPad on the couch. In the wide world of digital marketing and PR, there exist many more agreeable options. If you are struggling with Facebook and don’t even enjoy the medium, maybe it’s time to redirect your efforts elsewhere. Perhaps your time and energy could be better spent on Twitter, LinkedIn or a blog. Read case studies, ask around and give a new network a try. I’m far from the first person to suggest Facebook isn’t the social media marketing magic bullet, but I don’t think many take action in response. Has anyone out there abandoned their Facebook strategy? Tell us about it in the comments.